Okay, ladies. There is a pervasive belief that women should not lift heavy weights because they will bulk up. Just like any other myth out there, there are two general reasons that it won't go away. It tells many of you women what you want to hear. In this case, you don't have to lift heavy weights if you don't want to. You can tell yourself that you are working "smarter not harder." Unfortunately, the science behind this myth is bunk. Working smarter is working harder! For you to put on as much muscle as I have - and I'm not particularly muscular - you would have to lift heavier than I lift. Women just don't have the testosterone to build muscle like we do. Sure, there are a few genetic outliers out there as well as a few women who use dangerous performance enhancing chemicals to get that muscular, but that's not you! http://marathonsweetheart.com/2012/05/16/photo-badass-squat/ The woman in this picture is doing an incredibly difficult "pistol squat." This is more difficult than a one-leg lunge due to the depth of the movement. I can't do these.. unweighted. She has what looks like a bar plus about 90 lbs. I'm not strong enough. And I have fairly strong legs. I was at a seminar with a room full of trainers when the instructor did a set of these - unweighted. The room full of trainers was really impressed! Trainers! This woman is doing them weighted! 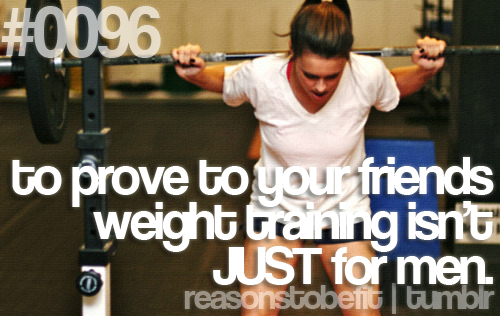 And weighted heavy! Now that you've taken in just how tough this is and how strong her legs must be, look at how muscular those legs look. Not really all that much, right? I mean, yeah, she's got some nice definition. But she isn't "bulky", and she certainly isn't unappealing. If 50 lbs squats would make you too muscular, just how big would this woman's muscles have to be, then? http://joshsgarage.typepad.com/articles/2011/08/get-abs-like-this-never-lift-more-than-five-reps.html A woman named Neghar describes her kettlebell routine with heavy, heavy kettlebells. She calls them "double 20's". That means two 20 kilogram weights, or about 45 pounds with each hand. As you watch the video, listen to her voice and watch the way her body moves and ask yourself if she is more masculine than you would want to be. I would guess you think she looks great. That's because she does look great! You may also notice that she talks about never doing more than 5 repetitions per set. To really get the idea for this, try it some day. Pick something you are used to doing and do only 5 repetitions. If you can get to 6, add 5-10% weight. At at that weight, try to do 6. If you can, add weight again. And again. Once you've hit the mark where you can only do 5, go on to other unrelated movements and come back to the weight where you left off and go through the same pattern yet again. Plan on adding weight another 3 or 4 times. That's how heavy Neghar has lifted for an extended period of time and she looks the way she does. She squats 170 pounds, deadlifts 250, and presses those two 45 pound kettlebells. The quote of the interview for me? "I like feeling strong." http://www.shape.com/fitness/workouts/8-reasons-why-you-should-lift-heavier-weights Let's let Shape Magazine put some more background together for us. This magazine isn't exactly Meat-head Monthly, so hopefully you'll take their word for it. http://todayhealth.today.msnbc.msn.com/_news/2012/05/08/11583414-ask-jenna-how-can-i-lift-weights-without-bulking-up If not Shape, how about MSNBC? We trust them, right? Okay, so the question now is "how heavy is heavy?" To start out with beginners, I usually start them at 15 repetitions. Know this -- that's light! But, the lighter weights confirms that the person can consistently do the movement safely. Then, I'll add weight until they can only do 12. That's an adjustment for most women. Now comes the psychology. I'm aiming for shorter sets but I want to be sure the person challenges themselves to get as much done as possible. So, the "goal" is 12 repetitions, but I add weight until they can't do that many. And falling short of 12 is just fine. The real target is more like 8-10. When someone is really good? Then, we're talking even shorter. Seriously, folks. All those ladies out there (perhaps you are one of them... or you were one of them) have been wasting their time with a fraction of the improvement that they could have had thanks to really bad advice. This myth is really hurting people who need to lose weight or need stronger bones to fight osteoporosis or need to keep up with the game of life. 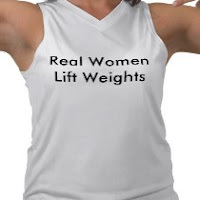 Let's get this idea out there and get all the women in our lives to lift heavier weights.